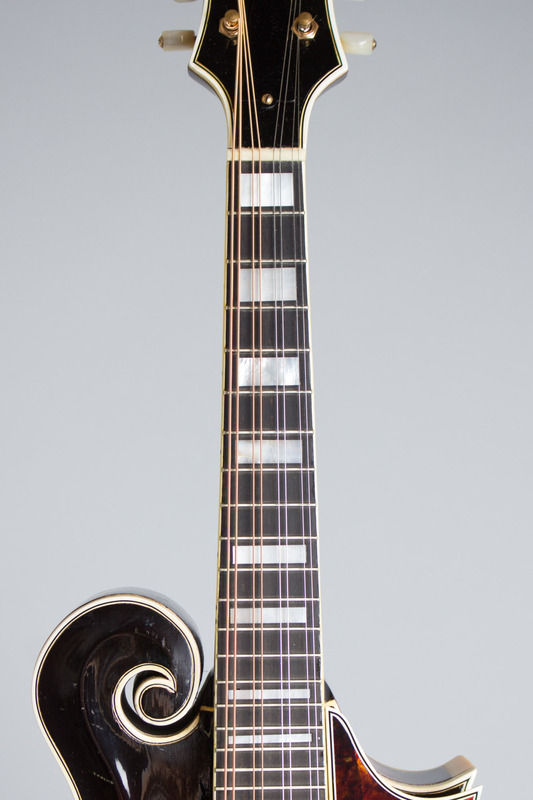 Gibson F-5 Model Carved Top Mandolin (1938), made in Kalamazoo, Michigan, serial # 95361, sunburst lacquer finish, maple back, sides and neck, spruce top, ebony fingerboard, original black hard shell case. 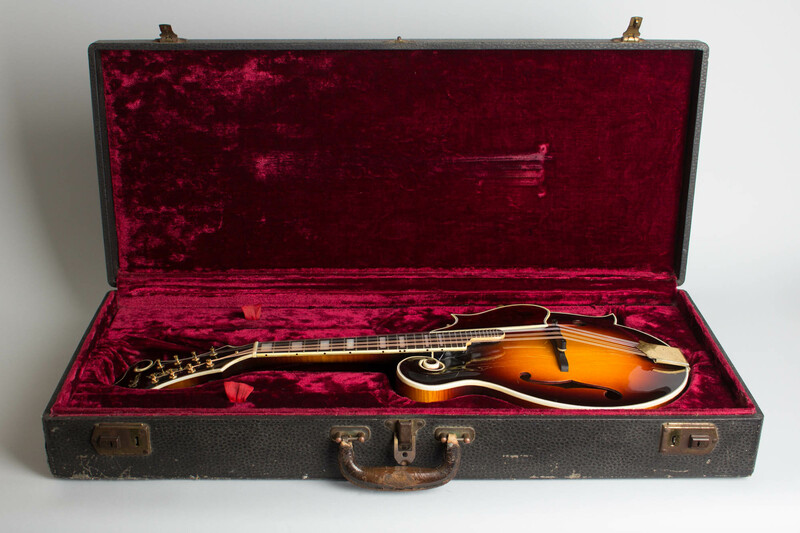 This is an amazingly well-preserved example of a pre-WWII F-5, Gibson's perennial top-of-the-line mandolin. This rarely-seen instrument was built and sold in 1938, at the height of the swing era when interest in all mandolins was at low ebb. While 20 years earlier Gibson was a mandolin company that made guitars, by this later date the guitar was all the rage and the mandolins were built only in very small numbers. All Gibson mandolins from this period are rare, but these very expensive F-5s were built in miniscule numbers as there was hardly any market for them. 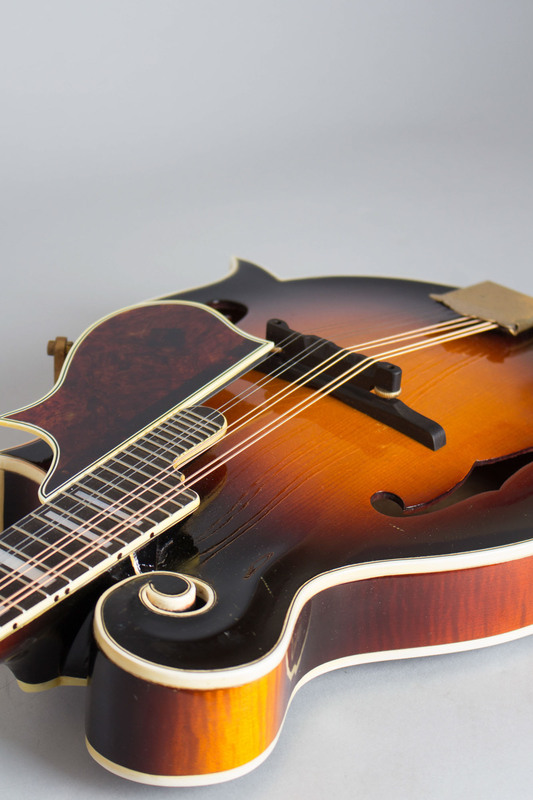 The original F-5 was Lloyd Loar's baby in 1922-25, the flagship of the Gibson "Master Model" line and at the time the most expensive and innovative mandolin in the world. 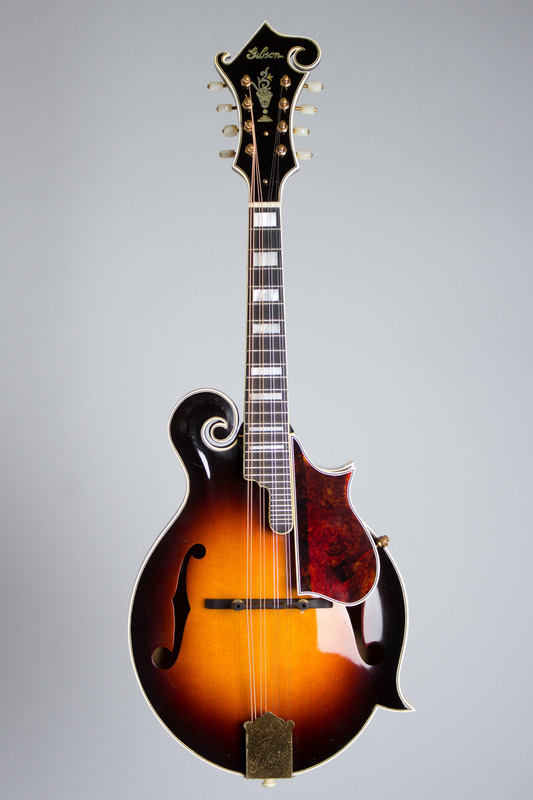 Loar's re-design of Gibson's earlier instruments essentially invented the modern mandolin, including now taken for granted features like the adjustable bridge and truss rod neck. These instruments were designed for classical and ensemble playing; Bill Monroe would not use one to invent bluegrass until many years later! After Loar's departure, the F-5 generally took a back seat to banjos and then guitars, and by the time the Depression hit very few people were willing or able to plunk down the F-5's list price of $250 for a mandolin! 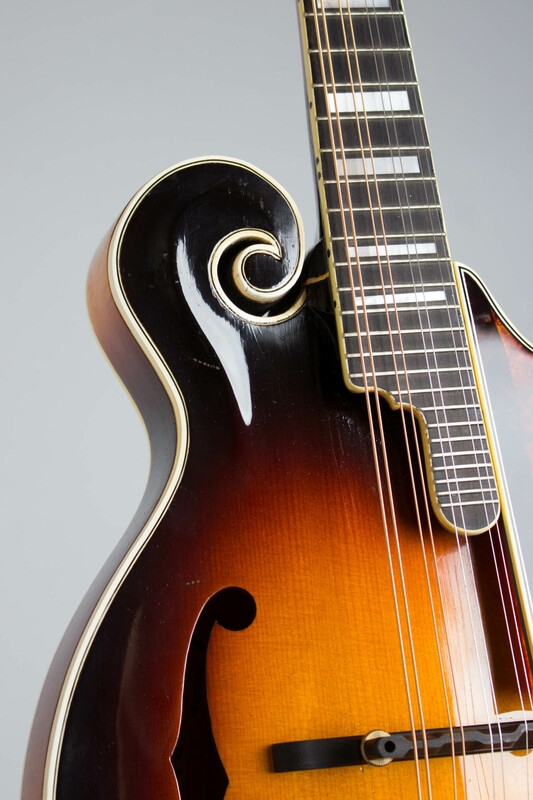 This 1938 F-5 has many detail differences from the Loar-era models, but is similar in most major respects. 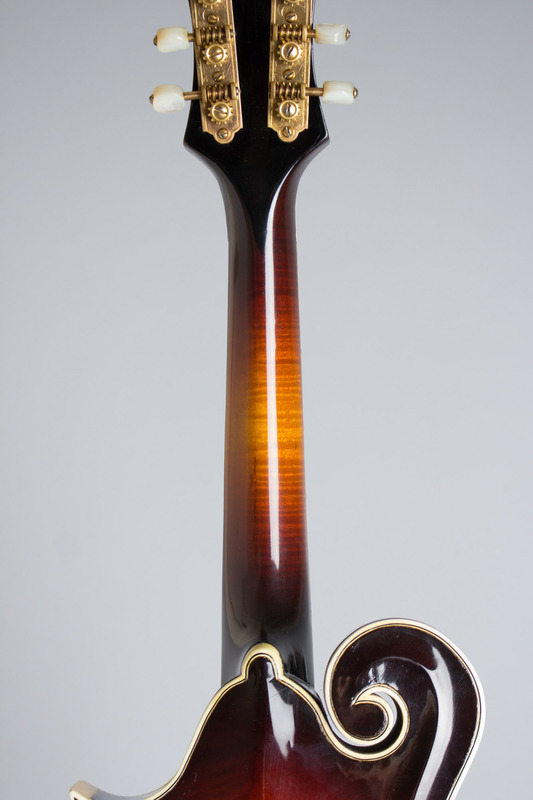 The asymmetrical body with upper scroll and two points on treble side has a carved spruce top with violin-style f-holes. 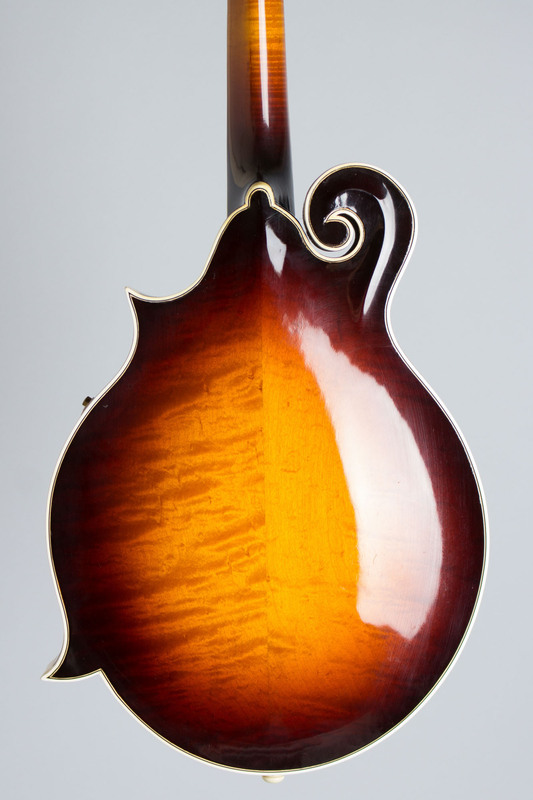 It is triple-bound top and back with a rich sunburst finish on all surfaces and a nice curl to the maple back. The single-piece maple neck has a bound ebony fretboard with side stripe binding, pearl block inlays from the first fret, and treble side extension with a total of 29 frets raised above the body. 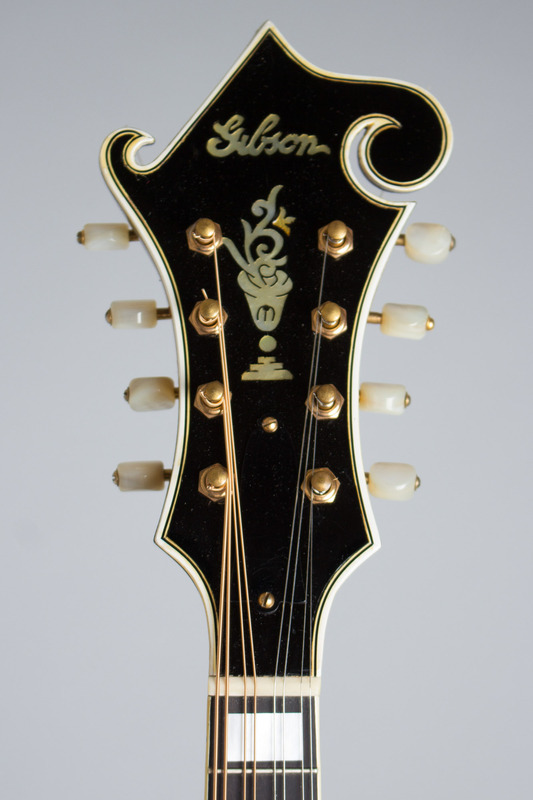 The triple-bound headstock has the traditional F-5 pearl "flower pot" under the pre-war "Gibson" script logo inlaid in peghead. 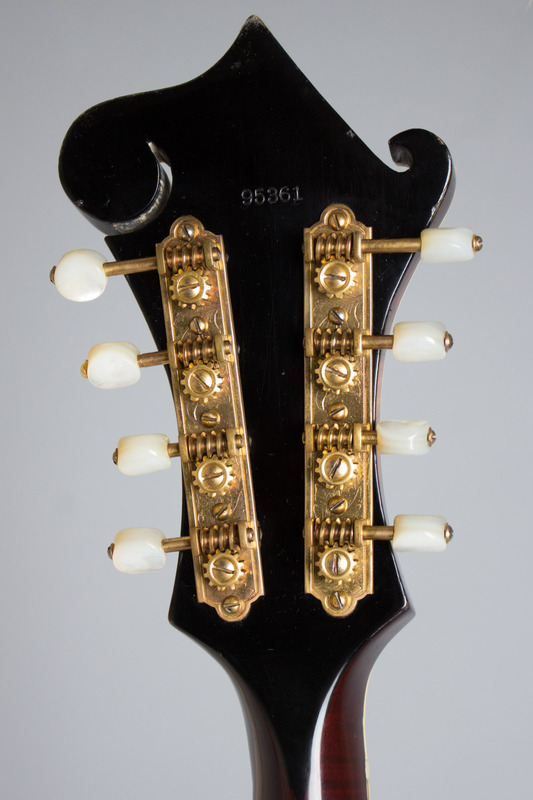 The gold-plated Waverly openback tuners have pearl buttons, while the gold plated tailpiece still has the old Art Nouveau 1910s Gibson logo engraved. The adjustable ebony bridge had gold-plated wheels, and the triple-bound edge celluloid pickguard has a gold-plated support. 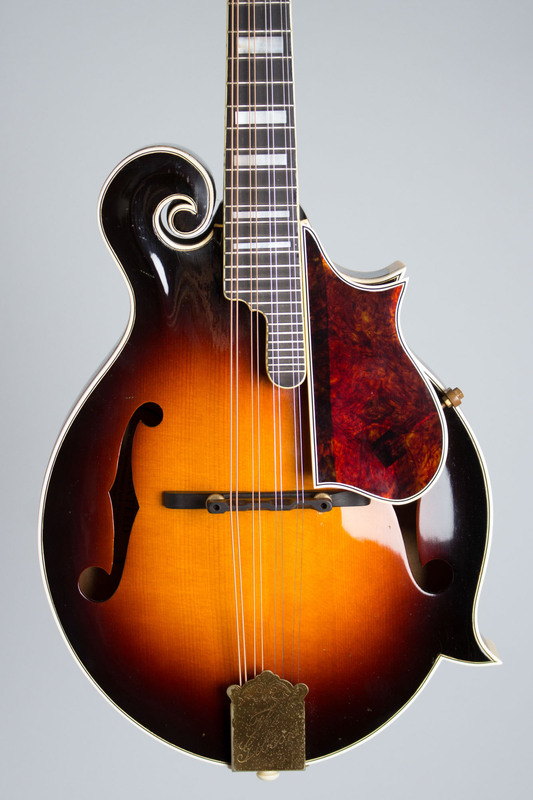 While many consider the 1930s to not be the greatest era for Gibson mandolins, this F-5 is a surprisingly fine-sounding instrument, with plenty of volume, a lot of clarity, and a good "chop." While "Loars" are the traditional bluegrass standard, Sam Bush and Barry Mitterhoff are two virtuoso players who have performed for decades on F-5s from this late pre-war period. This one-owner mandolin has a known backstory, and this is what we were told. It was purchased new as a birthday gift for a young girl in 1938 who proved to have little interest in learning to play it, and after a spell of careful if unproductive lessons was put away, only recently coming to light again. The state of preservation is amazing, at least compared to most of the pre-war Gibsons we see. While we find it a little bit sad it was rather underappreciated in its day, the mandolin is now reconditioned to fine-playing condition and ready for a second run at being the world-class instrument it was built to be. The deluxe square HSC is included. Overall length is 27 9/16 in. (70 cm. ), 10 1/16 in. (25.6 cm.) wide at lower bout, and 1 11/16 in. (4.3 cm.) in depth, measured at side of rim. Scale length is 14 in. (356 mm.). Width of nut is 1 1/8 in. (29 mm.). This mandolin is in spectacularly well-preserved original condition, just about the finest example of a period F-5 we have ever seen. There is little evidence of wear to the finish from play, just some light checking, small dings, and a few pick marks, and the instrument still shines like it did in 1938. There is a bit of color loss and spotting to the lacquer-coated gold-plated tailpiece, but the gold-plated, pearl button Waverly tuners look practically new. The only oddity we note is the serial number has been carefully hand-stamped into the back of the peghead over the finish in smaller numbers than Gibson usually used -- it is possible it was returned to the factory for some service early on, or it may be a dealer marking. As with many Gibson mandolins from the later 1930s, the neck on this F-5 was originally somewhat underset from the factory, and the instrument's state of preservation may well be at least partially attributable to the fact that as built it simply did not play that well! 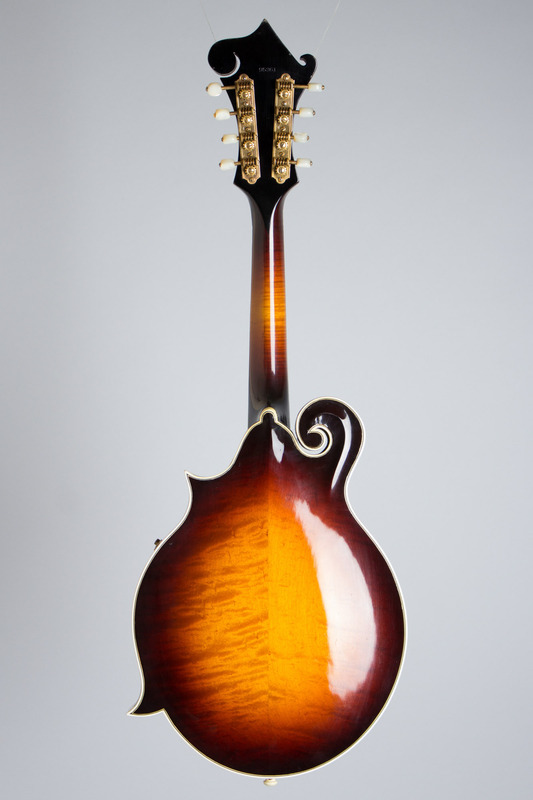 We elected to have the neck reset and the instrument reconditioned by Gibson mandolin maestro David Harvey, and the results are truly spectacular. In addition to correcting the neck angle, the frets were replaced in exact period style, a repro bridge top added to the original base, and a reproduction pickguard mounted; the original is included but has suffered some celluloid decay. The mandolin now plays the way it was intended to, with a moderately low action and plenty of room to go higher or lower as desired. The sound is crisp and powerful, and we expect it will deepen and mature with some serious play time -- for which this instrument has been waiting since 1938! Excellent + Condition.